Recently, I made walking a daily habit. My wife Anne and I often go together, here in the neighborhood, as we did this afternoon. Our family moved to San Diego’s University Heights area in October 2007, to be close to her dad, who at 94 lives on the next street. On the adjacent block there are several cats we often visit, but one I hadn’t seen for several months. 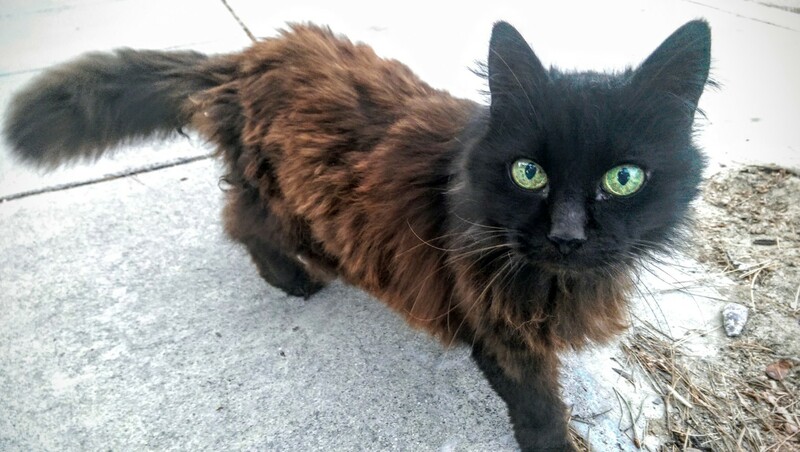 The lady who cared for the kitty was outside today, and Annie asked about scruffy Copper. Where is she? Last year, animal rescue euthanized the feline following a vicious dog attack; in the cactus and bushes where she often safely stayed. The injuries were too severe for recovery. 🙁 Copper came to the apartment building that became home as a stray. Her caretaker-benefactor tried taking the cat inside, but Copper refused confinement. That’s not to say she strayed far from her adopted outdoor home. Anne and I could walk by and see her nestled in the bushes or inside the space between the two sides of a fence. Copper craved attention but rarely appeared to be satisfied by it. Her mew was soft, crackly, and weak. If judging only by her voice, you might mistake Copper for an injured or dying cat. But she was cared for and well-fed. She was lively in her skittish ways—coming for pats but not receiving them for long. Something about Copper reminds Annie of Cali, our daughter’s cat, who joined our household in October 2014. Five months earlier I featured the rust and black beauty in product review “HTC One M8 is a Worthy Phone Camera“. To my horror, I do not have saved on any cloud or local drive photos from the shoot. Whew, Google Photos synced from the phone. The featured image is one of the outtakes, shot on May 10, 2014. Vitals: f/2, ISO 320, 1/17 sec., 3.82mm.